Brock Lesnar entered MMA just over three years ago, yet he already dons the sport’s most coveted title. While he may have been a massive slab of raw talent the first time he set foot inside an Octagon, the heavyweight has steadily refined his game and now has a new chiseled frame to boot. Lesnar hasn’t been seen since handing Shane Carwin the first blemish of his professional career. Since unifying the 265-pound crown in July, he went into hibernation and recently emerged a buff, bearded beast. Although the former WWE employee was already the sport’s most imposing figure, he aggressively adjusted his diet and looks noticeably leaner as a result. 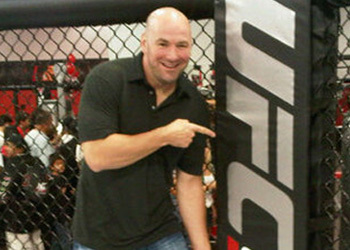 Much to the pleasure of UFC president Dana White, who was filmed boasting to color commentator Joe Rogan about his controversial title holder. They raved about UFC 121‘s star-studded roster so much, it was as though they were filming a promo video for Saturday’s extravaganza. Rogan made special mention of Lesnar’s much-improved hand speed, while White appreciated his ripped physique. According to Lesnar, he’s already floating right around the 265-pound mark and won’t have to cut much weight, if any, when it’s time to tip the scales on Friday. UFC 121 will be jumping off Saturday inside the Honda Center in Anaheim, California.